Do you have some discount policy? Yes, we provide 30% discount to all children under 15 years old. And every 6th person is for free (e.g. you book tour for 6 persons, but you pay 5 only or you book tour for 12 persons, but you pay 10 only). Which document do I need to take? We recommend to always travel with your current passport/ID, visas and travel insurance. Do you go in any weather? Yes, we go in any weather. We have mild climate in Czech Republic. In the worst case it can rain. And the rain usually does not last long. In case of raining, we will provide you raincoat free of charge. What clothes and footwear should I take on tour? Especially comfortably. On some tours there is some walking, so comfortable shoes are recommended. Also check the weather forecast and dress accoring to it. And do not forget suncream and sunglasses especially in the summer months. For further information please check Special outfit in tour description. How can I pay for souvenirs, snacks, toilet etc.? Sometimes it is possible to pay by credit card (VISA, MAstercard), but usually you need to pay cash in CZK. We recommend to bring some small local cash with you. Can I drink tap water on the tour? Yes of course, tap water has excellent quality everywhere in Czech Republic. What will be the lunch like on the tour? Some tours are coming with the lunch. Lunch includes soup, mail dish and one drink. We try to offer you tasty local specialities, but the choice is always up to you. There are also vegetarian dishes on the menu. Our guides are experienced people, mostly local to the region of the tour. They know what to do and what to tell you to bring the best to you. We are focused on small groups. The atmosphere is much more friendly and your experience is deeper. There is usually around 8 persons on our tours. Do not worry of full big bus with 50 people on board. Are your tours physically demanding? Most of our tours are easy with slow and short walking only. But there are some tours of a little higher dificulty. For further information please check Physical rating in the tour description. Which type of tour is right for me? We have several tour types and new are coming in the future – to cover most of clients needs. It depends on your personal interest to choose the right one. But do not worry, all our tours are interesting. Why should I go with you? We guarantee great day, lots of fun and unforgettable experience! Green Zebra Tours is startup tour operator based in Prague, Czech Republic. 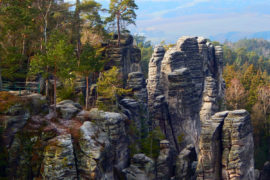 We focus on out of Prague activities, mainly in the Bohemian Paradise, the region we come from. As we are local in this region and its surrounding, we can guarantee unique experience to you. Join our tours and have unforgettable moments!